The tiled terracotta roofs of Hvar from above, taken whilst en route to the historic fortress. I’ve just returned from five glorious days exploring the Dalmatian coastline of Croatia’s western edge. If I’m honest it simply wasn't long enough to pack in everything we wanted to experience, managing only to visit the second city of Split and 2 beautiful islands, Hvar and Marinkovac, there’s actually another 79 to explore ! Croatia is rich with history and culture, what other European countries can you name where cities are built inside a Roman palace and moreover reasonably well preserved ! It’s also home to some of the most breathtaking beaches in the world, many which are uncrowded and unspoilt with dramatic pine-tree backdrops, colourful caves and miles upon miles of mosaic rocks and stones ! Croatia also has incredible walking routes, worth the hike in blistering heat to see the amazing scenery en route and from above. If you’re looking to enjoy Croatia from the comfort of your sun lounger, it is bursting with bohemian style beach clubs serving delicious fresh seafood, more than likely caught that very morning. Below I’ve put together a short list of must do’s, sees and experiences as well as my 5 top travel tips for visiting Croatia. Whilst staying in Split we ate at Bokeria, a fairly new restaurant in the old town. Taking influence from Barcelona’s famous La Boqueira market, the menu is mostly Mediterranean cuisine created depending on what foods are in season at the time. The interior again takes inspiration from Spain with coloured mismatched tiles and ginormous hangings of cured meats and garnishes. Walls are adorned with carefully chosen wines and spirits, literally displayed from floor to ceiling as well as a special solo wall dedicated to Aperol ! Bokeria is little more pricey than most of the other restaurants in Split but worth it for the quality of the food, inventive menu and stylish ambience. I would recommend trying the ox tail and chateaubriand risotto, it ended up being one of Alex’s most favourite meals from the whole holiday ! Now I know it’s not exactly the height of sophistication but Toto’s situated at the front of Split’s Port does a damn good burger and fries ! I’m not just talking about a standard patty and a couple of leaves, Toto’s has a whole host of different burgers from vegan to pulled pork and chorizo, buttermilk chicken to a triple stacked pile juicy beef patties. Healthy it is not but tasty it most definitely is ! Their lunch meal included a regular burger, fries and soft drink or local beer for around £9 - £10, pretty good value for quick, cheap and tasty eats. Our Air BNB host came up trumps recommending an amazing seafood restaurant, Junior. This no frills, tiny eatery is located down a backstreet just off the main square in Hvar and if it hadn’t have been recommended to us, we probably would have walked straight past it. The magic happens in the kitchen where they have been perfecting the same dishes for over 22 years ! We shared the seafood platter consisting of calamari, scampi, jumbo prawns, mussels, one whole sea bream and sea bass with a selection of boiled, buttery potatoes and vegetables, it was delicious ! The service was really warm and super attentive, our waitress kindly filleted every single bone from each fish with absolutely precision ! For a bottle of wine and the seafood platter we paid around, £55 in total. This family owned tavern in the ancient part Hvar, serves traditional Croatian cuisine; our Air BNB sweetly described it, 'recipes her Grandmother used to make'. The unique location had been formerly been used for generations as a wine cellar and was also the family home of the owner’s mother. Staff are dressed in national costumes and folk music plays in the background whilst you dine. This sweet little side street bar has live music every night and is great place to start your evening. I love the unusual seating area on the steps, it's a nice spot to hide from the sun for a few hours and as you can see it makes a beautiful photo opportunity. Situated above Hvar’s theatre house, this sweet little bar has amazing roof top views of Hvar ! Owned by our Air BNB host and her husband, their secluded little hideout offers warm table views and probably the best seats in the house to see Hvar’s historic Fortress lit up at night. Built within a dramatic, gothic alcove within Split's Old Town, La Bodega was our go to place to enjoy really good Croatian wine. The outdoor seating area is situated within the historic palace walls whilst inside you can take part in wine tasting masterclasses within an antique wine cellar decorated with midcentury furniture and interiors. This teeny, micro bar is one of those places you walk past a million times in the day and never notice it until you see the gentle glowing light gleaming through Split’s narrow Old Town streets ! Serving expertly executed craft cocktails, the dark and moody atmosphere of Noor is the perfect place to enjoy a late night tipple. Though do consider it has no seating and it can get very cosy inside the this tiny hole in the wall, so it’s probably best to enjoy your liquor on the street outside. Ok, so I’m writing this blog post with similar age people in mind, perhaps who are holidaying with their best friend, partner or maybe even as a solo traveller ! There are many ‘in-crowd’ beach bars in Croatia that are very loud, very crowded and eye-wateringly overpriced. Avoid these. Our Air BNB host suggested a great spot called Falko, a bohemian beach bar in Hvar serving botanical-themed cocktails, fresh fuss-free food and offering heavenly lounging options, tree hammocks or huge plump cushion beds, the choice is yours ! Naturally, their playlist consisted mostly of chilled out reggae gently interrupted by the sound of the ocean. Perfect ! Another great recommendation by our Air BNB host was to hop in a water taxi and visit the Paklinski Islands, located no more than 20 minutes from Hvar. She recommended that we visit Marinkovac, the second closest island and spend sometime at her favourite beach, Mlini. Just as she promised it was so picturesque and tranquil. We moored into a tiny alcove dotted with a handful of make-shift sleepy beach bars and followed the hand-made signs to Mlini. We walked a short way through a forest until we saw the turquoise water peep through the branches as we drew near ! Just when I thought Croatia couldn’t get anymore beautiful, it did ! If your looking to elasticise your budget, it comes no surprise that I’d suggest opting to stay in a self-catering apartment. Be aware that a lot of places aren't exactly aesthetically pleasing so don’t go expecting a design-led loft apartment with statement lighting, midcentury furniturenand well kept botanical sun terrace. Most as very basic, functional spaces, simply as a place to lay your head. If you are however looking for that home-away-from-home feel, we did manage to a rare gem via Air BNB. Morana and her husband have creatively crafted their handmade home from scratch, literally hand making the furniture ! 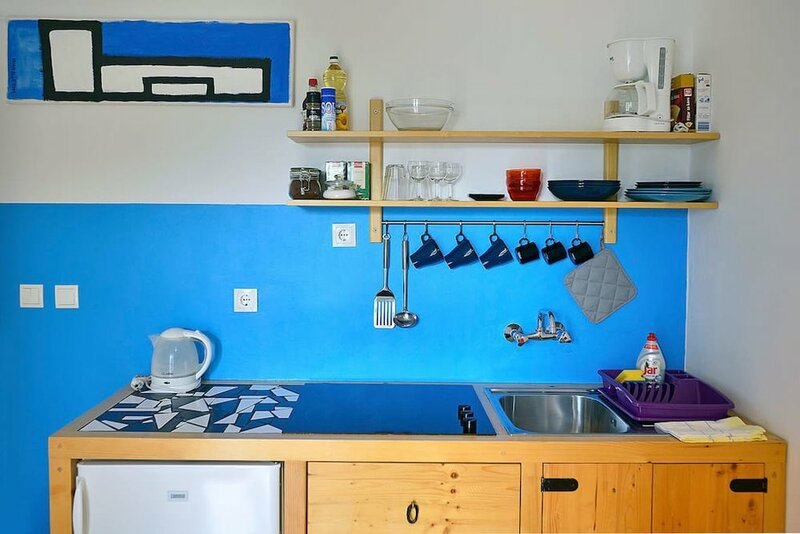 They have lovely taste, opting for a blue hue theme throughout the ground floor apartment which features two essential necessities air com and a shaded sun terrace ! 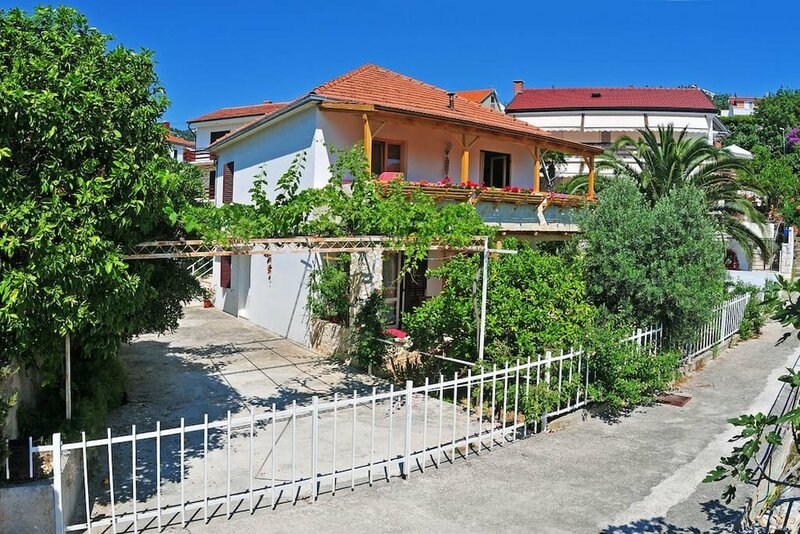 The location is excellent too, it’s situated on a very quiet street mostly habituated by locals and is a 5-10 minute walk from Hvar Old Town and also the Port where you will arrive and depart from. Hotel Podstine, sitting pristinely at the pinhead of Hvar’s stunning winding coastline, is my recommendation if you’re looking to splash out. The 4 star eco-friendly hotel has its own secluded beach surrounded by palms and pine trees as well as 5 restaurants and bars, including a smoothie bar where every drink is made completely from scratch ! They also offer a stunning wellness centre and spa. The hotel interior is fresh and modern, think sunburst orange paired with natural, rustic materials like rattan, wicker and driftwood adorned with huge palm trees lazily leaning in nook and corners. It’ll take you around 15-20 mins to reach Hvar Old Town, strolling along the wonderfully scenic bay and passing an array of inviting beach bars and clubs. Be warned it may take you even longer, if you give in to temptation ! The local currency in Croatia is Kuna. Whilst some places do accept Euros and even Sterling, you will get a much better exchange rate by paying with Kuna. Change your currency once you are actually in Croatia by visiting a Mjenjačnica (bureau de change) that are really easy to find in city centre and you’ll get much more for your Sterling. Though try to avoid the ones located near ports as they are likely to offer bad rates and charge commission. It’s a good idea to plan your trip carefully by researching where you would like to eat, drink and visit to avoid changing too much Kuna and being left with unused currency. If you are planning be active in Croatia, you’ll probably need more than a pair that flimsy flipflops as walking routes are often rocky, steep and uneven. I’m not suggesting you pack walking boots but definitely opt for a more sturdy sandal like Birkenstocks or Tevas. Drink the local wine, look out for red Plavac from the islands of Hvar and Vis. Dalmatia’s whites include Posip and Grk from the island of Korcula, and Vugava from the island of Vis. Around £3.50 - £5 per glass. The local beer ‘Karlovačko’ is really light and not too gassy, it’s super cheap too priced anywhere between £1 - £2.50 depending on where you are. Meal portions are HUGE in Croatia, unless you have the appetite of a horse, consider sharing plates especially at lunch time. I’d suggest using Hvar as your base if you are planning on island hopping around Croatia. Personally, I found Hvar to be the most beautiful of the islands with just enough going on both in the daytime and at night. Finally, I was a little surprised to find that Croatia is more expensive that I first thought. Having visited nearby counties such as Slovenia, Hungary and other parts of Eastern European, Croatia is definitely more pricey. You’ll pretty much pay the same for food, accommodation and travel as the UK. Have you visited any of the places listed above ? I’d love to hear about your experience and any additional actives you’d like to recommend. Please leave a comment below.